The factory-supplied warning triangle is attached to the inside of the boot lid. – To remove the warning triangle, push the tab in the direction indicated by the arrow ⇒ fig. 264 and pull the retainer down. 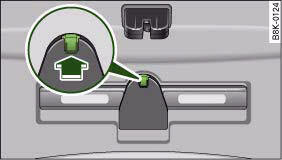 The retainer on the boot lid is specifically designed to hold the warning triangle supplied as an Audi Genuine Accessory. This accessory is available from Audi dealers.